The increasing international fragmentation of production has triggered the development of a number of widely used indicators accounting for value added ﬂows in the world economy. This paper generalises these measures by simultaneously considering the import side and focusing on bilateral gross and value added trade ﬂows. 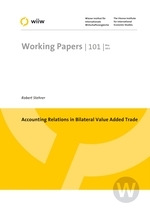 It discusses how these indicators relate to each other, the role of double counting in bilateral value added trade, and aggregation issues in global value added ﬂows. Using the World Input-Output Database (WIOD) selected results on bilateral value added trade for the EU 27 countries, the United States and China over the period 1995-2011 are presented.